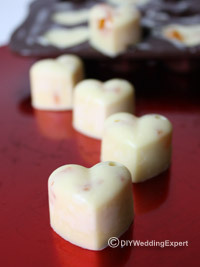 To create these delicious white chocolate wedding favors simply follow my tutorial for Diy wedding favors chocolates. Just use white chocolate instead of the dark chocolate. 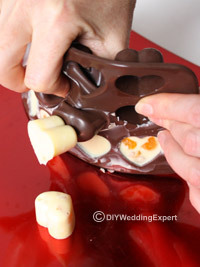 I’ve added chunks of dried apricots into the heart shape mould before pouring in the melted white chocolate. By adding the apricot you create a unique flavour to your chocolate wedding favors. You can also add frezze-dried strawberries, nuts, candied peel and raisins. 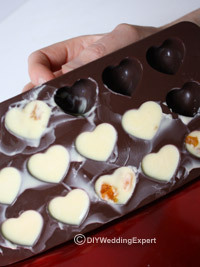 Why not go ahead and make your own special white chocolate wedding favors.